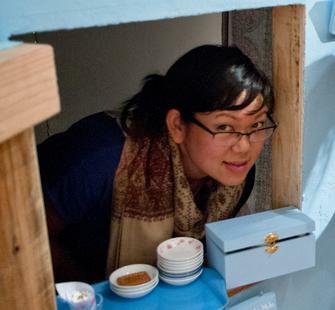 Sita Kuratomi Bhaumik is an artist, chef, and educator who tells the stories of our migration through food. Raised in Los Angeles and based in Oakland, she is Indian and Japanese Colombian American. Sita holds a B.A. in Studio Art from Scripps College, an M.F.A. in interdisciplinary art and an M.A. in Visual and Critical Studies from California College of the Arts. Sita has exhibited, collaborated, and cooked in the US, Holland, Ireland, and Mexico. This includes RayKo Photo Center, Yerba Buena Center for the Arts, The Asian Art Museum of San Francisco, The San Jose Museum of Art, SomArts, 826 Valencia, Whitman College, Southern Exposure, Stanford University, Shankhill Castle in Ireland, and the Future Food House in Holland.